The season wasn’t more than seven weeks old and General Manager Danny Ainge made a blockbuster. Sending point guard Rajon Rondo to Dallas in exchange for a couple of pretty good role players and a first-round pick. A month later and a Jeff Green trade to Memphis left the Celtics with two extra first-round picks and a 13-23 record. Right before the All-Star break Ainge made what turned out to be a huge deal for the second half of the season. But still, when acquiring Isaiah Thomas from the Phoenix Suns, the Celtics still entered the break at 20-33. Most of the world, including myself, probably thought the rest of the season would just be tank city for Boston. But it was far from it. Boston finished the season 20-9 and with an overall record of 40-42. Good for seventh-place in the Eastern Conference. Getting swept by the Cleveland Cavaliers in the first round was a surprise to no one, but the way Boston finished was. 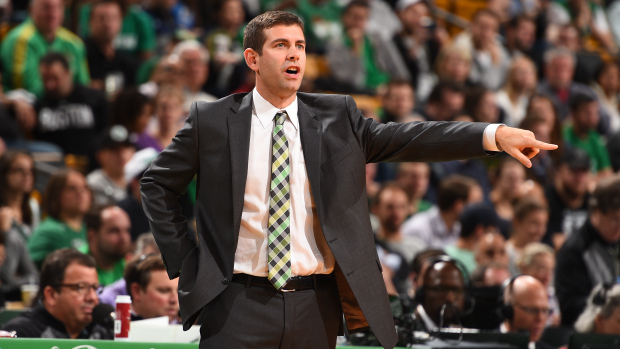 Now going forward, the Celtics have a great young coach in Brad Stevens who is viewed as unconventional by most but yet a genius at the same time. And even though they didn’t win a playoff game, those four games on the national stage against the might Cavs was huge for the immediate future of the Celtics. Not just because it gave those young guys vital playoff experience. But because everyone else in the league, specifically upcoming free agents, now realized how good of a coach this young team had. And how hard these players fought every minute. This Celtics team literally has just about everything, except that big piece. That big star. Obviously that’s no easy task. But having a lot of hard-working role players that understand what they need to do and a good scoring young guard in Isaiah Thomas is a great compliment to that star player. Should they be able to acquire one. Clearly Gerald Wallace’s number is the biggest eyesore on the list. The only saving grace is that his contract runs out after the 2015-16 season. Reports have also surfaced that Ainge is willing to part ways with a first-round pick just so someone can take Wallace’s contract. And why not when you have an absurd ten first-round picks from 2015 to 2018. Assuming everyone stays put for next season, Boston is looking at a salary cap of roughly $40.4 million, which would give them about $27 million in cap space. They will also pick at 16 and 28 in the upcoming draft so that number drops about three million. Now the “problem” I guess you could say about having all of these first round picks is that a lot of them look to be in the mid-to-late first round between their own picks and some of the teams they’ve acquired picks from like the Clippers and Mavericks. But the one gift that’ll keep on giving is that atrocious trade made with the Brooklyn Nets. That pick is unprotected in 2016 and if Brook Lopez opts-out and goes elsewhere, that could be an extremely valuable trade chip. And because of these valuable trade chips from the Nets, the one deal I think Boston could and should make is to get DeMarcus Cousins from the Sacramento Kings. We all know about George Karl’s ego. He wants to be the star of his team. He won’t be with a monster like Cousins on that squad, and the Celtics could offer them an extremely enticing package to pry him away in the off-season. If the Celtics offer their first-round pick in 2015 (16th overall), Kelly Olynyk, Gerald Wallace and the Nets unprotected pick in 2016 that could be a great starting point. And if they have to part with one more future pick in order to get a guy like Cousins then it’s a no-brainer. Having someone like him gives this roster of good, solid players, that one true solidified superstar talent. And then from there it’s up to Stevens and the Celtics staff to develop Marcus Smart and James Young into the talents they’re supposed to be and provide support for Cousins and Isaiah with scoring and defense. There are very few teams in rebuilding mode that are in a better position than the Celtics. You can easily argue that there are none. If Ainge can get rid of Wallace’s contract by itself, it would give the team over $30 million in cap space to go after free agents. Either way. Whether it’s a big free agent signing like Marc or LaMarcus Aldridge, or a blockbuster deal to bring in someone like Cousins, the Celtics have so much flexibility and a lot of really solid players that their future is incredibly bright. And in this Eastern Conference, just adding one like like that could put them in the top-three in a hurry.